Facebook and Twitter posts combined make up just 0.2% of the number of emails sent each day– this is good enough to explain how important email marketing is for the business development and brand building of your company. One of the most obvious benefits of email marketing is its lower cost compared to mainstream marketing channels. There are no print or postage costs and no fees paid in exchange for exposure on a certain billboard, magazine or television channel. It is way more personal compared to Facebook post or tweets. With email marketing it is very simple to segment the customers, track them and nurture them based on their responses and interests. So smart marketers consider email not just essential to their business efforts, but foundation to their marketing and sales systems. 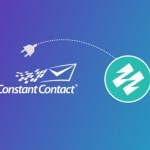 This is where ConstantContact becomes very handy for every Marketer. It gives you the features of uploading all the leads gathered from different landing pages and then nurture them by doing different marketing campaigns. It helps you to track and get reports in real time, monitor your open, bounce, and click through rates, plus survey responses and coupon redemptions. These features helps to dig out the qualifying sales leads to be worked on and Zyprr helps you to perform all these within your CRM. Zyprr platform enables you to integrate with Constant Contact which helps in converting qualifying leads into an opportunity and grab sales. Leads with good response from the campaigns of Constant contact can easily be updated in Zyprr and then it can be followed up with proper drips. Each activity of those leads can be tracked very easily and campaign responses can easily be synced to Zyprr contacts/ leads. The advanced reports and dashboard features give you the overall view of your campaigns so that you can customize it to get the exact results and set future goals accordingly. In a nutshell Constant contact is the primary source from where qualifying leads are generated and then Zyprr comes in place synchronising those leads and digging out the opportunities from them. This results in sales which is the ultimate goal of every business. ConstantContact and Zyprr are complementary tools which help you to cut down the pressure of your sales team, generate and qualify more leads and close more deals.